These modern men's eyewear frames are the epitome of style and modernity. Plastic and metal frames create a unique and intelligent contrast. You'll get the reliability and practicality from the combination of materials while also creating a stylish persona. 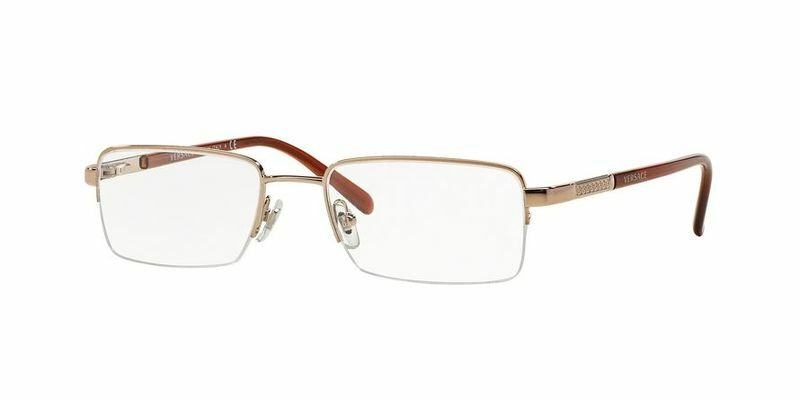 Adjustable nose pads for your Versace VE1066 glasses are the ideal solution if you want your Versace VE1066 eyeglasses fully customized to fit your face. Stop people on the streets with your striking eyewear. Semi-rimless glasses are back with a vengeance and everyone from the lawyer to the college hipster is getting on board. They'll give you an intelligent and smart appearance, which can be dressed up and down. While appearing smart and trendy, you'll also be able to rest easy knowing that your lenses will remain protected with the secured top rim. If you're after a pair of fashionable eyewear frames that are versatile and minimalist, these square eyeglasses will add the right amount of sophisticated cool. Pair them with your business attire or a pair of simple blue jeans and shirt; you'll still look the part no matter where you go. Add more definition to your rounder face to show the world who you are - it's up to you how you wear them! Whether it's a busy day in the office, spending time with your loved ones or having a much-deserved weekend off, these classic Versace VE1066 frames will help highlight your best features without overpowering your face or style. Temples, which are often called arms, should sit comfortably on your face. This is why it's essential to experiment with different temple positions. These medium temples that slightly hook behind the ear will give you a look that is balanced and polished.